Last Sunday I was getting a bad case of cabin fever before the start of the Packer playoff game against the Cowboys. I was tempted to try out the new skis, despite the probable poor conditions at Lapham Peak, a park that boasts a small system of trails where the snow base is man-made. The park is a 20 minute drive from home, and I wasn't sure I wanted to commit to what might be a disappointing experience. So, instead I went skating. We have a park near us that constructs a rink every winter. It is not huge, but I knew it doesn't take much to tire out this 55 year old skater, so I thought I'd give it a whirl. I was trying to determine the age of my hockey skate and I narrowed them down to being about forty years old. 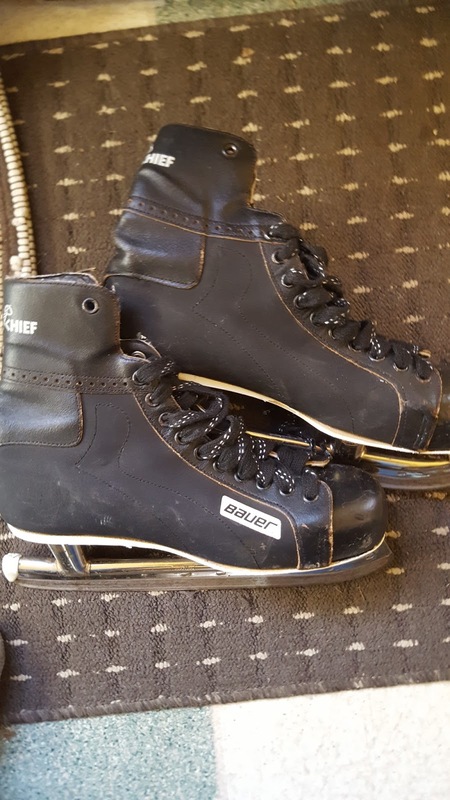 When I googled them, one eBay site labelled them as "Vintage Bauer Big Chief Skates." I'm the proud owner of "vintage," I guess. I think I got them in about 1977 and, because I never skated more than a few times a year, I never saw the reason to upgrade. If I couldn't justify an upgrade 20 years ago, I really can't justify one now. So, I'll just keep sharpening them and hope for the best. Once I got my skates on he was just finishing up. He said, "It's all yours, young man." Us old guys call each other that as a form of compliment. Hey, it helps. I started out going round and round counter clockwise. Shaky at first, but eventually got into a pretty good rhythm. After too many laps to count, I took a break. Then I started out going clockwise. I discovered that I am a much better clockwise skate. I was trying to figure out why and realized it's because I was always a left handed hockey player. The balance of a stick always made me a better counter clockwise skater, I guess. It was a weird revelation. I skated for probably an hour or so, stopping to tighten my skates three times during the course. It brought back such great memories of skating with my high school buddies at Como Lake in St. Paul. They always made a speed skating track at the lake, as well as a hockey rink complete with boards and a warming house. And I remembered my stepfather skating with me there once on a Saturday. When I mentioned I was thinking about going, he said he'd like to go, so he dug his skates out of storage and off we went. He let me drive his Datsun F-10 (probably because he'd had a few drinks) which had a manual transmission. I managed to shimmy-and-shake it to a grinding halt on a couple of occasions as we laughed our heads off around the traffic circle by Como's pavilion. He skated well for an old guy (probably late 40's at the time) with his hands in his pockets and a cigarette in his lips. And as stupid and piddly as it was it meant something to me that he would come along and do something he probably hadn't done in 20+ years himself. He mentioned the event several times over the years, so I have a feeling it meant something to him as well. My point is that while going skating alone at 55 because your kids are older or not around might seem odd, it should not keep a guy from doing what he likes. I do it for the workout and to ward off the winter blues as much as anything. If that makes me am odd duck, well, quack quack. See ya on the ice!